Internet streaming giant Netflix Inc (NFLX) faced a litmus test of sorts after the closing bell on Tuesday, as it posted its first-quarter 2019 earnings. This was the first time the video-content giant face the market in what is now looking to be a market of many prospective heavy hitters. Netflix reported a whopping 22% jump in revenue to hit $4.5 billion, with global streaming paid memberships soared 25% higher at 148.9 million. Net income rose 19% to $344 million or 76 cents per diluted share. In the quarter, Netflix recorded its highest quarterly paid net adds in its history — a 16% rise to hit 9.6 million. However, Netflix shares quickly dipped in after-market trade, possibly due to the 23% drop in quarterly paid net adds in the US market alone. It has been barely a week since Disney announced plans to launch its $6.99-per-month streaming service Disney+. Given the sheer quantity of content the media conglomerate has at its disposal, Disney+ could give Netflix a run for its money if it doesn’t pull its socks up. With Apple also joining the streaming race with its new offering, Netflix stressed that ‘content is king’ and invited the competition to the party. “We don’t anticipate that these new entrants will materially affect our growth because the transition from linear to on demand entertainment is so massive and because of the differing nature of our content offerings,” said Netflix in a statement. “Both companies are world class consumer brands and we’re excited to compete; the clear beneficiaries will be content creators and consumers who will reap the rewards of many companies vying to provide a great video experience for audiences,” the streaming giant said about Disney and Apple entering the market. 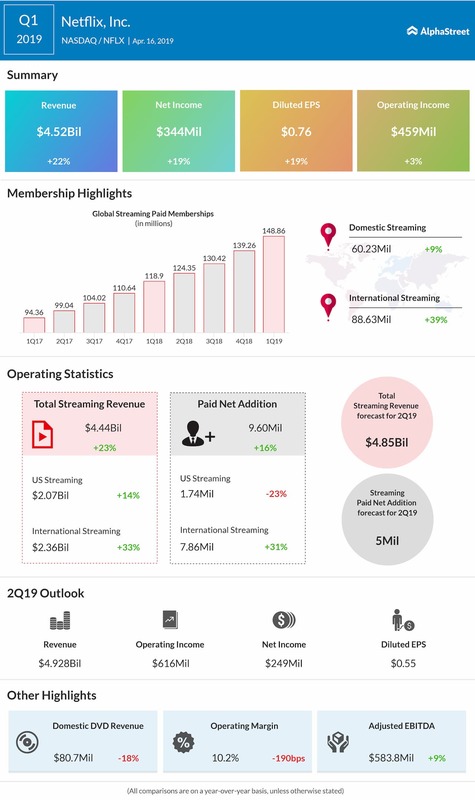 As it posted quarterly results the streaming giant also announced its outlook for the second quarter of fiscal 2019. In the upcoming quarter, Netflix is looking at its revenue jumping about 26% year-over-year to reach $4.93 billion. Net income for the second quarter is estimated to be $249 million or $0.55 per diluted share. As the streaming market gets populated, Netflix is of the opinion that online content will follow a parallel structure like when cable TV became prevalent back in the last ’90s. Rather than seeing its competition as threats, Netflix seems to have welcomed them into an industry it hopes to benefit from new content.